Managers of the world seem to be united in their passion for wasting time at work, writes Shyamal Majumdar. The Mumbai branch head of a navratna public sector company wanted to replace a 10-year-old wooden showcase with something that occupied lesser space. He wanted to just dismantle the showcase, but stopped after his veteran secretary suggested that he should at least inform the administration department in Delhi. The branch head succeeded in disposing of the showcase last week - but almost eight months after he had initiated the process. Listen to what happened in between. The administration head asked him to send a formal letter detailing the reasons for his inclination to get rid of the showcase. That is required, he was told, as none of his predecessors had any problem with it. Two months after the sending the letter, the branch head was told that inspections by the local administration and accounts staff showed that the book value of the showcase was Rs 1,900, and that he should ask for quotations from at least three interested buyers and send them for approval. The process of getting quotations took a long time, as the branch head found it difficult to get anybody interested in the rickety showcase. After much coaxing and cajoling, he managed three quotations from local furniture shops. The highest quotation was for Rs 700. The documents were despatched to Delhi immediately and the branch head hoped his ordeal was over. But, it took the headquarters another two months to send him a letter informing him that the quotations were considered too low by an eight-member purchase/disposal committee and he should advertise in a local newspaper asking for fresh quotations, according to office rules. The advertisements elicited four responses and, this time, the highest bid was for Rs 850. The branch head was told that the purchase/disposal committee was preoccupied with other work and he would have to wait for his turn. The approval came after three months. In the meantime, the owner of the furniture shop who was the highest bidder lost interest in buying the stuff. The branch head says he paid the money himself and somehow convinced the gentleman to give him a receipt. The showcase was broken down by the office boys as there were no takers. The branch head says he is unable to figure out why it took the eight members of the committee so long to decide on something that yielded the company just Rs 850. "The company spent much more on courier charges alone," says the young man. The eight members of the purchase/disposal committee are certainly not alone in perfecting the art of wasting time at work. Late Sumantra Ghoshal used to often say that a whopping 90 per cent of managers waste their time by procrastinating, becoming emotionally detached, and distracting themselves with supposedly busy work. Here are some examples of how many things "busy" people are doing that will never be missed. Some managers will just stare at just about anything so that people around them think that they are pondering something intense. Some will go a step ahead and schedule meetings just to tell juniors to "work smarter, not harder" and to "think out of the box" etc. Some managers will send emails and call up sales people to find out about things that would have got done anyway without their intervention. Yet others will insist on a written report for just about everything. But on being given a written report, these managers would say that they don't have the time to wade through all that garbage and ask juniors to tell them about the matter in their own words briefly. If the subordinates come in with a verbal suggestion next time, these managers would choke them off in mid sentence with, "I can't even begin to think about it until you put it in writing." In their delightful book, The Peter Principle, Laurence J Peter and Raymond Hull (people who have devoted many years to the study of incompetence) have talked about managers having Rigor Cartis, an abnormal interest in the construction of organisation and flow charts, and a stubborn insistence upon routing every scrap of business in strict accordance with the lines and arrows of the chart, no matter what delays or losses may result. The Rigor Cartis patient will often display his charts prominently on the office walls, and may sometimes be seen, his work lying neglected, standing in worshipful contemplation of his icons. These type of managers are always frantically busy, drawing up reports and flow charts and making appointments to confer with one another. Another vice-president of a company has been labouring for three years to write the company's history, which the top management hopes will remain incomplete when he retires. The most popular form of wasting time at work is, of course, social networking. Walk into any large office, and you will most likely hear the telltale computer bleeps of chat programmes and online games, accompanied by furious mouse-clicking. Employees may seem busy, but many are wasting time on the Internet, or are "cyberslacking". A study by Assocham last month has warned that employees waste a minimum one hour of office time every day accessing social networking sites for reasons other than work. Assocham's Social Development Foundation survey says companies effectively lose 12.5 per cent of total productivity each day. Nearly 82 per cent of workers have a Facebook account and the average worker uses it for 30-40 minutes a day which adds up to a lost week each year. Also, 77 per cent of workers who have an Orkut account use it during work hours. And 83 per cent see nothing wrong in surfing during the office hours. Four in every 10 workers built their entire Orkut, Facebook profiles during work. The survey says most organisations do not monitor and manage these sites as closely as email. However, this problem is not restricted to India alone. Managers of the world seem to be united in their passion for wasting time in office. Time-wasting at work was spoofed in the 1999 cult film Office Space, while The Office, a British TV comedy that now has a US version, has shown characters playing a computer war game as part of what they described as a team-building exercise. Consider this: Americans do work hard at surfing the Internet and catching up on gossip, according to studies done by Salary.com and America Online. The average worker admits to frittering away 2.09 hours per 8-hour workday, not including lunch and scheduled break-time. 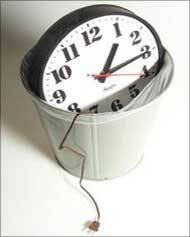 As a matter of practice, companies assume a certain amount of wasted time when determining employee pay. The average yearly American salary is $39,795 per year, or $19.13 per hour. If the average worker wastes 1.15 hours more than employers suspect, per 8-hour work day, that adds up to $5,720 per year, per worker in wasted salary dollars. So with the American workforce 132 million (non-farm) employees-strong, the total in lost salary dollars adds up to $759 billion per year, the studies have shown. No such detailed study has been done in India. But the money companies lose due to time wasting by employees would surely not be insignificant. Are social networking sites killing productivity?